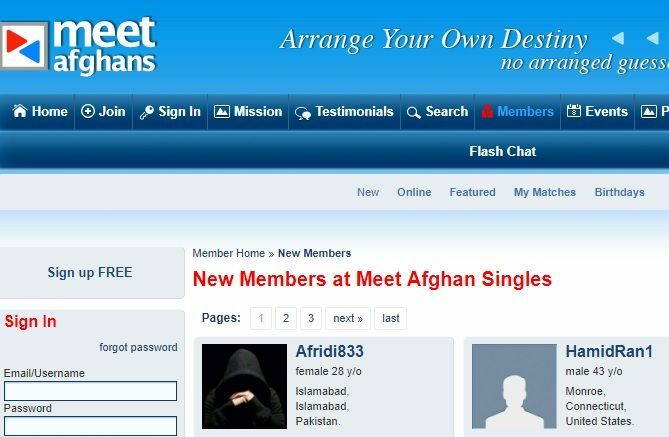 Meet Afghans is a nice dating website which promises their users to meet people from Afghanistan. However the website has lost its popularity and it is almost empty at the moment. If you would like to register to a website which has lots of users, this won’t be a good opportunity for you. The website is free and you can still give a try to this website though. There is also a nice chat feature on Meet Afghans. The website is free to register but unfortunately there are not many active users on Meet Afghans at the moment. It means when you message to people, you will hardly get a response from them and that can be a little bit disappointing for you. Since the website is a free service, you can still use this though. We recommend you to be careful about scam and fake accounts though. Dating websites with low popularity has many scam and fake accounts inside. Actually there are too much interesting features of the website but they doesn’t mean much when there are not active users on the website. When we have checked the last blog posts on the website, it was about 2 years ago. It seems moderation has quit the website and it is standing on its own. We could not detect any region nor a country for this website since the website is not getting enough traffic from the any country. That means website has not really very active users at the moment and you will hardly meet online people. If you have any good memories with Meet Afghans, you can leave a review below about the website. You can also write negative reviews. We are going to check your review as soon as possible and approve it.